The group arrived at the studios at 11am to take part in final rehearsals, although during the day they also gave interviews to Swedish radio, speaking to visiting host Klas Burling. The hour-long show featured, along with The Beatles, PJ Proby, the Vernons Girls, Long John Baldry, Millie, The Jets, and NEMS artists Cilla Black and Sounds Incorporated. It was first broadcast in the UK on the ITV network on 6 May from 9.45pm, and in the US by ABC on 15 November. 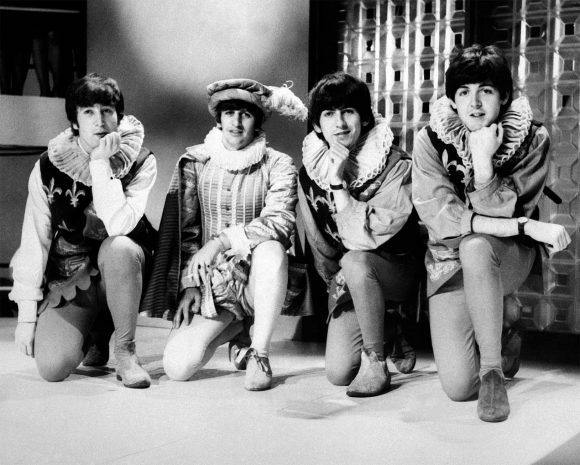 The Beatles took part in two segments in the show: a musical set and a spoof of Act V Scene I of Shakespeare's A Midsummer Night's Dream. John Lennon, Paul McCartney and George Harrison also mimed a trumpet fanfare at the start of the show, before Ringo Starr appeared with a flag to set off a cannon ball. The group also introduced PJ Proby's performance. For the Shakespeare spoof, Lennon took the female role of Thisbe, McCartney played Pyramus, Harrison was Moonshine and Starr played Lion. Incidentally, McCartney later owned a cat he named Thisbe. The songs performed by The Beatles in the show were Twist And Shout, Roll Over Beethoven, I Wanna Be Your Man, Long Tall Sally and Can't Buy Me Love, as well as a special medley of their earlier hits – Love Me Do, Please Please Me, From Me To You, She Loves You and I Want To Hold Your Hand – and finally a version of The Isley Brothers' 1959 song Shout. The music had been pre-recorded at London's IBC Studios on 19 April 1964, and The Beatles mimed during the show. Their performances of I Wanna Be Your Man, Long Tall Sally and Shout were included on Anthology along with Boys but you haven’t included Boys on your list. Also, do you know why the other songs weren’t included on Anthology? I really wish I could listen to that medley. A new version of Boys was recorded for the show, but it wasn’t included in the final cut. I don’t even know if they mimed to it in the show. As the article states, the songs were non-EMI versions recorded nine days earlier. I don’t know why the other songs weren’t in Anthology. Certainly the show is one of the performances that really should be issued in full on DVD. The version of Shout, by the way, had around a minute edited from it when it appeared on Anthology 1 – I don’t know why; put it down to Apple’s infinite wisdom. The Shakespeare thing is on a DVD I own. It’s downright hilarious. John Lennon does this insanely low voice even though he was the female. Rngo says his lines as The Lion and then says “If I was really a Lion, i wouldn’t be making the amount OF MONEY I’m making today, would I?” or something like that. It’s pretty hysterical. For the Shakespeare skit, see http://beatle.wordpress.com/2008/08/28/video-the-beatles-shakespeare-spoof-from-around-the-beatles-in-full-color/. I was at that show…it was amazing. The tickets were free and were given to teenagers that were born on the chosen date. A raffle was held on the pop show…Ready Steady Go and if your birthday was picked you had the chance to win 3 tickets…one for you and two for your special friends. I was also at the show – but we went to the rehearsal. We lied about our date of birth to get a ticket and travelled up from the south coast for the show. I can’t really remember much about it – it was so long ago. I lied about my date of birth too. But because I wanted more tickets I went even further and said that I was a twin. The television company sent me SIX tickets! I remember everything about the show, it was amazing! I’m puzzled as to how the Shakespeare skit has turned up on the interweb IN COLOUR. Has someone colourised it at some point a la All You Need is Love on the Anthology? Or was it originally filmed in colour? Surely not……? I would love to be enlightened! Correct me if I´m wrong, but this ought to be the very last live performances of Love me do, Please please me and From me to you, as well as the only known time they did Shout. It may have been done before they made it big, of course. Watching this again, I get the feeling that they actually sing live on the show together with the pre-recorded music, sounds like it here and there anyway, Also noted that Ringo misses his cue at the start of I wanna be your man, but for Long tall Sally, there are three downstrokes, probably a guitar, for Paul to start the song at the right spot. George said “look you”. Really. George knew there was a time and a place for certain words. We also were at the Wembley television studios for the taping of AROUND THE BEATLES. It was on Monday 27th April 1964 and the studio was all scaffolding which the Beatles sat between. We all had to go outside and march in singing “We love you Beatles, we love you do” then were told we were not singing enough so had to do it again only to find out that it was not our voices being recorded but a choir.!! I went with my now husband of 50 years and we were 16 years old. I still have the ticket stub!! I was at this show. My friend Norma got the tickets, and took her boyfriend Chris and me. A night I will never forget. It was the second time I saw them, the year before I went to the Wimbledon fan club convention. Who played the ‘Wall’ in the ‘Midsummer Night’s Dream’ sequence’?